Small book from the part of 1653 that they called 1652, as the new year in this period came on Lady Day at the beginning of April. Not only lamenting the abolition of Christmas, but lampooning taxes and opressive government. Some nice details here. The soldier on the left is wearing a tied buff leather coat I think, though it could be a soldier’s wool coat. His breeches are unconfined and decorated with ribbons at the lower end. The guy on the right has a small brimmed cap with a band that just might be a knitted monmouth cap from the droopy brim. Note the belt around his waist too. Both have obvious hose details evident and the shoe detail is good too. French book by the Lord of Praissac, “Englished” (traslated) by John Cruso in 1639 who had written a cavalry manual himself some years earlier. 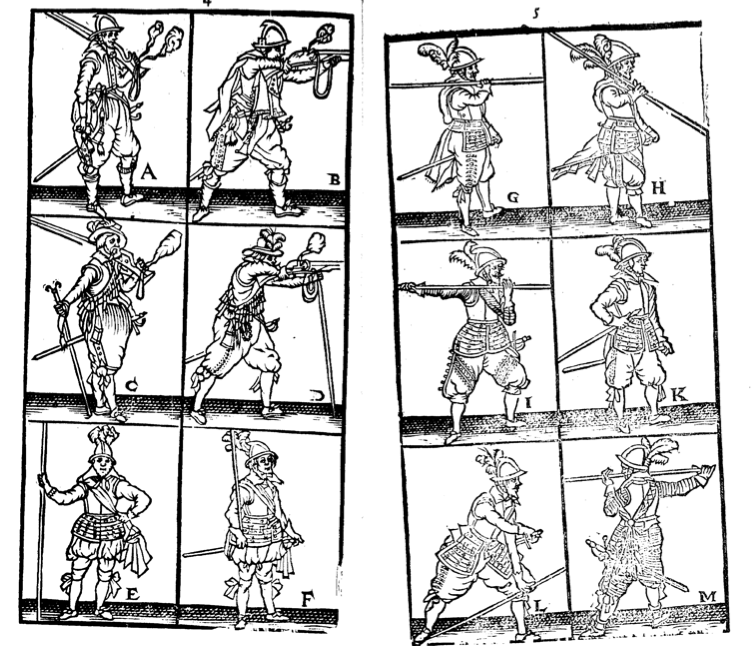 This is the only plate of actual figures in the book, it’s quite derivative of the Dutch engravings of Jacob de Gheyn from 1607, but perhaps Englished like the text and maybe updated, though the breeches in plates E and F certainly are very old fashioned for 1640! ..or A Shapeless Monster” A description of a female creature born in Holland, compleat in every part save only a head like a swine. 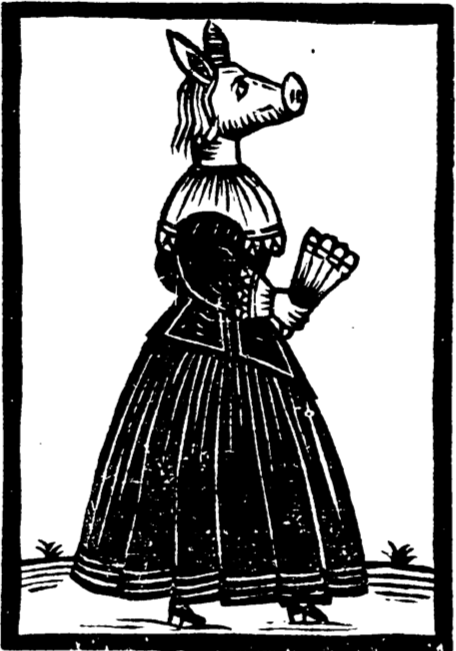 Printed in London 1639, this is another story of a pig faced woman. This time, she’s well dressed with a tabbed bodice, fancy collar, full petticoats and nicely heeled shoes. Hopefully she made enough money to keep the wolf from the door! “The High and Mightie Commendation..
..of a pot of good ale. Full of wit, without offence, of mirth without obscenitie, of pleasure without scurrilitie, and of good content without distaste”. 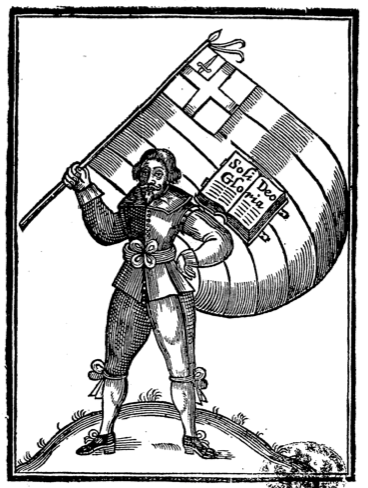 Poem from 1642. 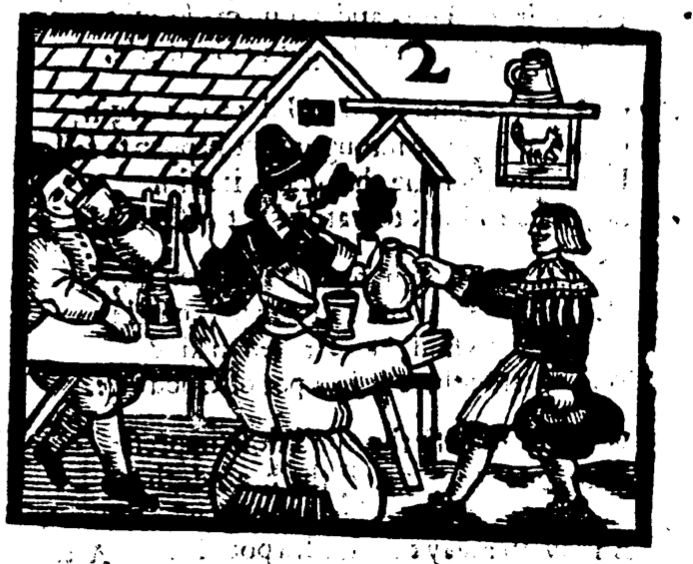 The woodcut is poorly reproduced, but here is a group of revellers sat outside the alehouse, quaffing their beer and smoking up a storm. The tapster is bringing another jug of ale out and doffing his hat. While most seem to be dressed in standard doublet and breeches, it’s the fellow in the foreground facing away from us that I’m interested in. I suspect he’s wearing a montero, though it would be tricky to prove, it does look very much like the segmented crown and (poorly folded) skirt of the fashionable cap worn by soldiers and huntsmen. Of Nick Frost the Tapster and Rulerost the Cooke, Concerning the restraint lately set forth against drinking, potting and piping on the Sabbath day and against selling meate. 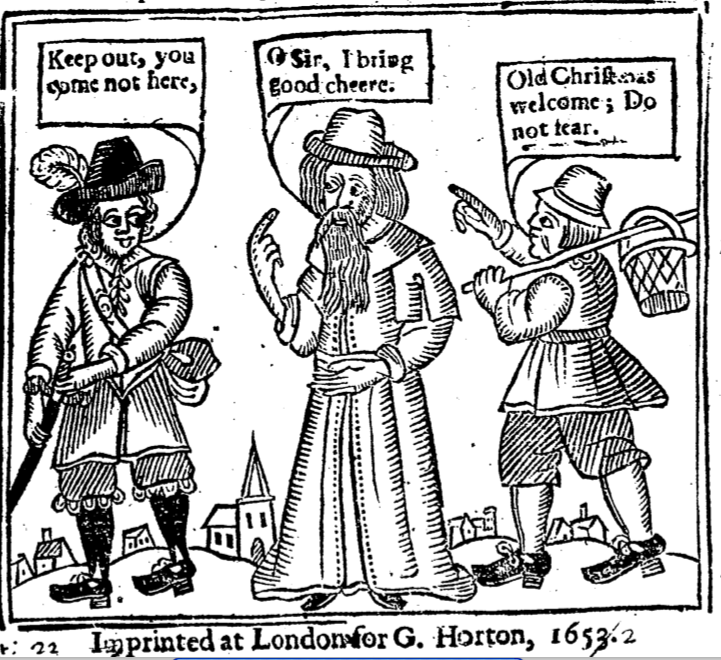 Printed in 1641 as a backlash against government controls on eating and drinking. 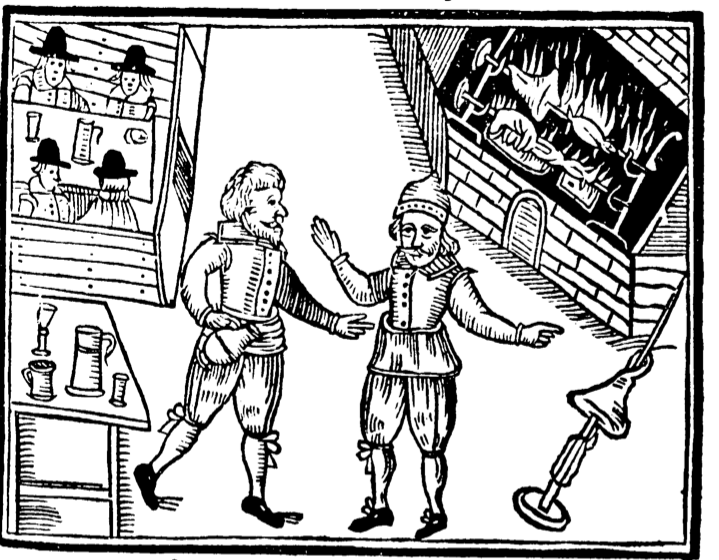 The tapster and the cook wear standard doublet and breeches with some nice little waist aprons to catch the drips/grease. 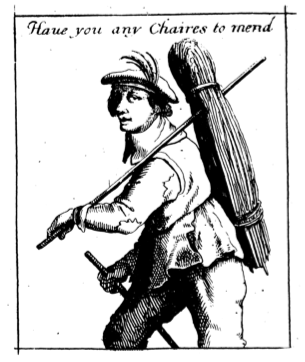 Rulerost the cook has what looks like a day cap with folded back brim, though this may be a 17th century version of the cook’s hat. 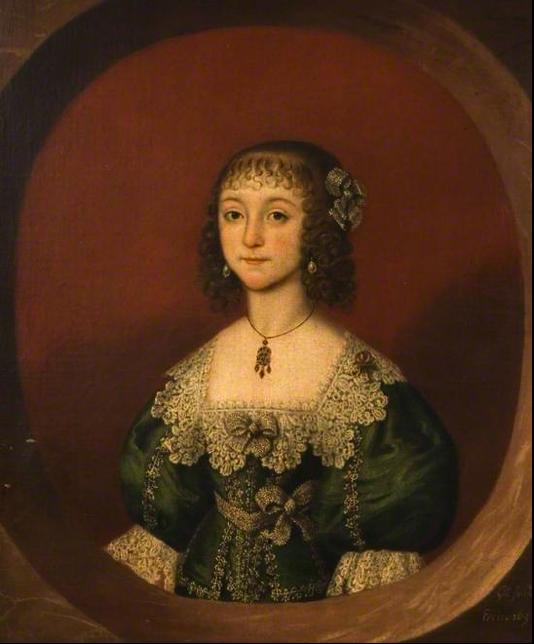 Henry was born in 1635, so judging by his age the picture was painted by the unknown artist in the mid 1640s. 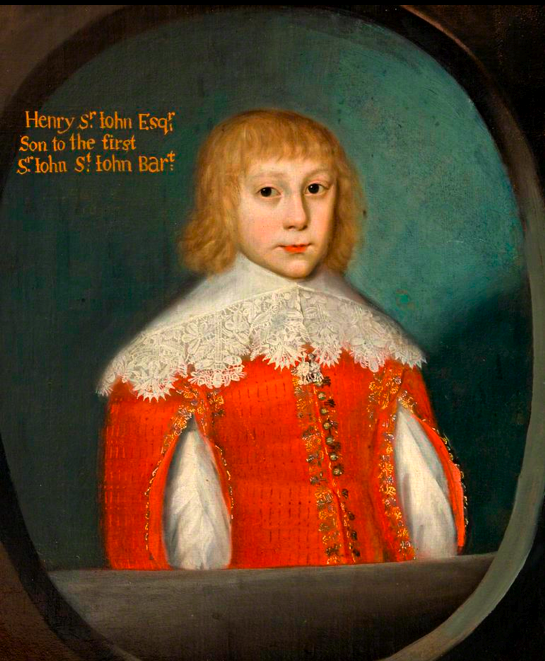 I can find little of note about Henry, but he’s wearing a splendid red doublet with slashed sleeves, showing his shirt beneath. decorated with braid and a needlepoint falling band. A Continuation of the Triumphant and Couragious Proceedings of the Protestant Army in Ireland. It may be an April fool, but this is a tricky image to date. 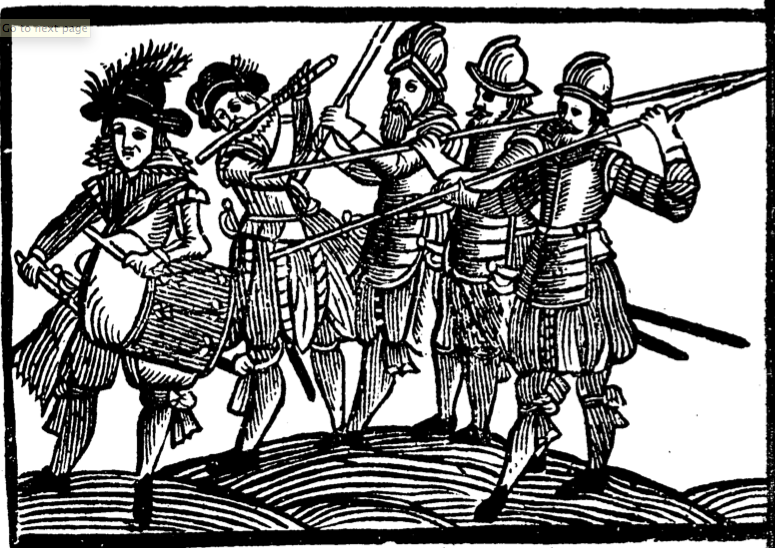 It appears in several publications and at first sight looks a little dated for the 1640s, with the baggy breeches and stiff collars, though it may be a representation of the trained bands of London who often drilled in their best, possibly slightly old fashioned clothes. However, as has been pointed out on several occasions since I posted the image, their breeches do look like German pluderhosen of the period, not standard English breeches.